Did you know that cardinals mate for life and return to the same nesting ground every year? Or that a roost of crows can number up to two million individual birds with complex family units that could include up to fifteen family members? Those are just a few of the many facts about common North American birds found in this lovely book authored by Michael J. Rosen and illustrated by Stan Fellows. Haiku seems to be enjoying something of a renaissance with dozens and dozens of poets sharing traditional and new haiku on blogs. One of the most striking things about this book is that the watercolors contribute to the impression that we're just catching a quick glimpse of the bird's busy life. The illustrations are masterful as they emphasize one or two physical characteristics of each bird and place them in a typical setting so that the reader gets a real sense of what they look like and where to find them. The book is organized into four sections that represent birds you would see during the four seasons. The color palette for each of the seasons also contributes to the impressionistic effect. There is quite a community of Canada Geese in my neighborhood and Rosen's haiku describes them perfectly. There are many wonderful facts about the birds scattered throughout the book in lovely script. My only complaint about the book is that these are very small and difficult to read. I had to pull out the magnifying glass and my eyes are not that bad. there is an appendix in the back of the book that gives more information about the birds, their habits and their songs. It is a beautiful book that can be shared many times throughout the year as the seasons change.It's a wonderful place to start a young birdwatcher. 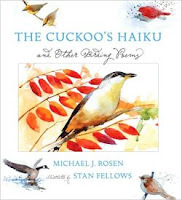 Thanks for finding our review of The Cuckoo's Haiku. We just posted a review of 7 picture books all dealing with haiku.